Enjoy maximum flight area for small to medium birds in this feature-packed economy aviary! 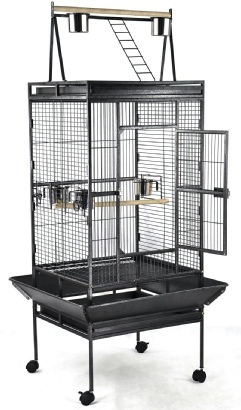 Rolling wrought iron flight cage combines roomy freedom with convenient features to make proper bird care easy and fun. Large front door give you easy access, and 4 nest box doors open for hassle-free maintenance. Features 4 plastic feeding and watering cups. Two, 1" diameter perching areas for twice the views. Slide-out bottom grille makes cleaning the plastic bottom tray a breeze. Store extra food and essentials underneath the sturdy rolling cart stand. Easy assembly required using included pictorial instruction sheet. 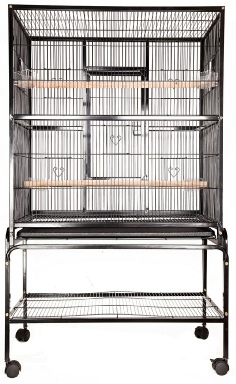 Spacious interior is perfect for single or multiple small-sized birds such as Finches, Canaries, or Parakeets. 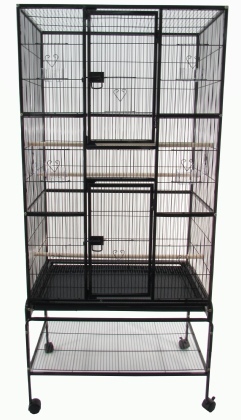 Also great for housing medium-sized birds such as Cockatiels, Conures, Lories, Senegals and similar. After 3 weeks of researching bird cages I ordered the B033 cage on a Tuesday and it was delivered to my door 3 days later. Took 45 min to build the cage , to set up perch,toys and feed bowls and then my 3 girls had their new home. This cage is Sturdy and very nice looking to. The wheels allow me to slide it over to all windows and doors for sun and fresh air. Most budgie cages are too small for several birds. But this has lots of room for our 2 -6 budgies with lots of room for toys , extra perches and lots of room to fly when they can't get out to fly. Easy to order on line, was delivered to the door in 4 days,, as expected. 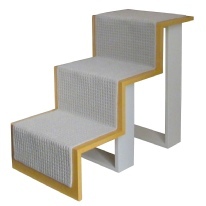 Easy to assemble with 2 people ( one to hold the pieces in place while screws tightened). The cage is sturdy and easy to clean. Nice cage good quality build and powder coated. Came earlier than expected, in a cardboard box--in good shape. Had all parts and was easy to put together. Great Cage. It's well made and our parakeets love it. It's big enough for 6 parakeets. Not difficult to put together- assembly instructions could be better. Highly recommend.